The president won't own up to wage damage from Obamacare, House leader argues. 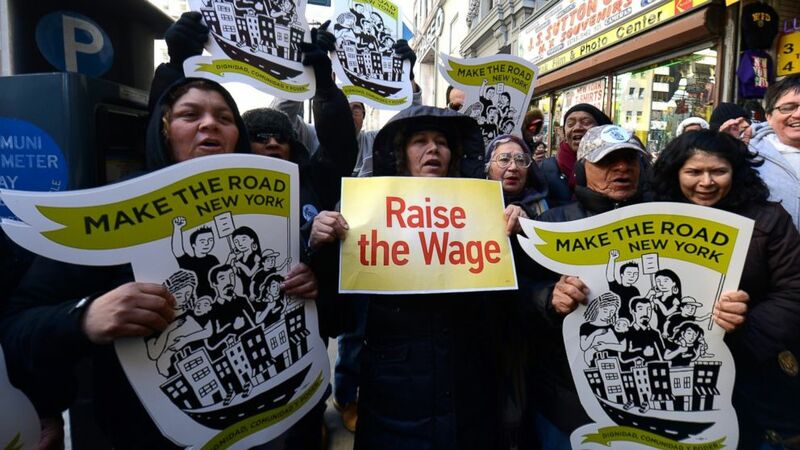 camera (Cem Ozdel/Anadolu Agency/Getty Images) Fast-food workers calling for better wages demonstrate outside a McDonald's restaurant on Fifth Avenue in New York, March 18, 2014. On Jan. 31, a fry cook asked President Obama why his hours were being cut to part-time because of Obamacare, and the president responded by saying he was pushing to raise the minimum wage. Just look at the math. In 2013, President Obama supported a $9 minimum wage. This year, he proposed a $10.10 minimum wage, which at the federal level turns out to be an increase roughly equal to the amount of wages a minimum wage employee would lose if they had their hours cut by 25 percent, as is happening under one provision of Obamacare. Coincidence? Here’s how Obamacare creates those wage cuts. Under the law, an employer is required to offer government-mandated health care plans to full-time employees if they have 50 or more employees. The law then goes on to define a full-time employee as someone working 30 hours or more per week. This added regulation makes it prohibitively expensive for many employers to keep all their employees working more than 29 hours, so hours are reduced, no new hires are made, and often jobs are simply cut. Many school districts near my hometown of Richmond, Va., are already implementing policies limiting part-time workers to less than 30 hours as a direct result. The added costs of government-mandated health care will strain their budgets and probably cause even more Obamacare-related job losses. In 21 states, the minimum wage is already higher than the federal minimum of $7.25. A substitute teacher in Washington state, for example, where the minimum wage is $9.32, could lose as much as $102.52 a week because of Obamacare. These wage cuts aren’t fair to the fry cooks and substitute teachers who didn’t see this coming and don’t deserve to lose hard-earned money in their pocket. The president is attempting to distract people from these wage cuts by proposing a minimum wage increase, but that would only make matters worse. The CBO found that about 500,000 jobs would be lost under the president’s proposal. One survey by staffing company Express Employment Professionals found that 54 percent of minimum wage employers would reduce hiring and 38 percent would lay off employees if the president’s proposals were adopted. Several more surveys and polls found similar findings. So in response to lost jobs, hours and wages due to Obamacare, President Obama is proposing cutting more hours, and more jobs. The madness has to stop. America is not working when Washington is creating incentives for businesses to cut back the hours and reduce the wages of hardworking Americans. America is not working when Democratic policies, like Obamacare, encourage people to be fired rather than hired. An America that works encourages job growth and encourages employers to offer more hours to its employees. An America that works gets Washington out of the way so middle-class Americans can experience higher wages, more hours, more opportunity and greater prosperity. In 2009, then-Speaker Nancy Pelosi, D-Calif., famously said of Obamacare: “We have to pass the bill so that you can find out what is in it.” Now that Americans are experiencing first-hand what was in the bill, Democrats are doing anything they can to push these policies back under the rug until after the next Election Day. It won’t work. All of the delays, all of the distractions and all of the political games cannot hide the devastating effects of Obamacare. And meanwhile, the victims of these Democratic tactics are the American people who deserve better. Democrats know the law they drafted is hurting people. Rather than hide the problem, let’s solve it. Next week in the U.S. House of Representatives, we will vote to restore wages and hours by up to 25 percent for Americans impacted by Obamacare. Let’s put the politics aside for once, and do what is right for the American people. Rep. Eric Cantor represents Virginia's 7th congressional district, serving since 2001. The Republican serves as House Majority Leader. Do You Still Have to Worry About Credit Card Gotchas? This story is an Op/Ed contribution to Credit.com and does not necessarily represent the views of the company, its affiliates, or ABC News.